The Renovo Public Library, in North-Central Pennsylvania, isn’t a handsome wood or brick building on the town square. It certainly isn’t anything like the New York Public Library’s main branch, on Fifth Avenue, with its marble lion guards outside and palatial rooms and hallways. Instead, it’s a small, squat former auto garage built with concrete blocks painted white. 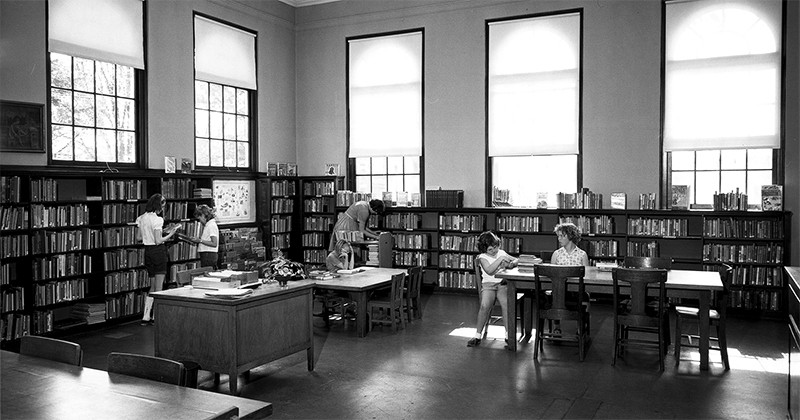 The building was remodeled and opened in 1968, in a campaign led by a group of schoolteachers and local residents to obtain, for our remote end of the county, a branch library. It sits on a rise overlooking the Susquehanna river, at the end of a dead-end street, all but hidden from the currents of town life. Frequently, I was the only person in the building, other than our librarian, Viv. I lingered there on drowsy after-school afternoons because I loved the sweet damp smell of paper and glue slowly decaying, because I loved pulling some forgotten old hardcover from the shelves, and because, simply, I loved being in a room filled with books. Two rooms, actually. There was a small-town stillness, an atmosphere of benign neglect inside our little library that suggested the great works of Western lit were mine alone to discover. A translation of the Greek epic poem the Odyssey had, according to its date-stamped card, an equally epic lending history: checked out twice in 1968, once in 1980, and again in 1992, before I came along, in March of 1994, when I was 17, and removed Homer’s masterpiece from its place for the fifth time in more than a quarter century. The persistent feeling that the public library belonged to me, that it was a clean, well-lighted place built and kept open for one reader, was reinforced in other ways. In One Writer’s Beginnings, Eudora Welty describes in fearsome terms a Mrs. Calloway, the librarian at Jackson’s Carnegie Library, who sat facing the stairs, “her dragon eye on the front door.” If Mrs. Calloway could see through a young woman’s skirt, Welty wrote, “she sent you straight back home.” Viv was no library overlord. She kept an ashtray in her top desk drawer to sneak drags of her cigarettes. She spoke in a Kool rasp. But mostly she silently communicated a do-as-you-please air, as if you had entered a self-serve cafeteria. Just like the desserts under glass, it was up to you to discover your favorites. I didn’t mind this one bit. I liked being my own guide. It created a sense of accidental discovery; and, simultaneously, the opposite feeling, that I had been led to certain books and authors by divining rod. Four blue metal bookcases, or stacks, each about eight feet tall with double-sided shelves and grouped in a single row, held the entire collection for adults—a small, manageable garden from which I drew nourishment over many seasons. I could stand amid those four bookshelves an hour or all day, the hum of the cooling fan and the squeak of Viv’s metal chair the only intrusions.